Several of our FVP authors and some of our author friends will have books available at Norwescon from April 2nd – 5th. You can see them here and find them online. We’ve created cards to help you find your Perfect Match. Remember these are for hooking up with the books, not the authors…but we love you too! If you’re at Norwescon, be sure to stop by and see us in the Dealers Room. Come down and see us at Norwescon this weekend! FVP is joining with Maple Valley Writer’s to bring you some great publications to see at Norwescon. See THIS LINK for more photos of our table… Author Jeffrey Cook will be there, as well as Rachel Barnard, Kennedy J. Quinn and more…. Be sure to look for some of our Sci-Fi, Fantasy and Steampunk authors at Norwescon on April 17-20. Authors Jeffrey Cook, Rachel Barnard, Kennedy J. Quinn and Thomas Alexander will be there in person, and you can find out more about books from David S. Moore and Victoria Bastedo. 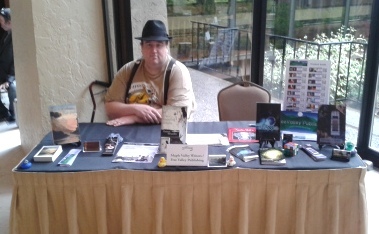 Stop in at our author table and say Hello.